Welcome to tourism portal with information from the region of Javorníky Mts. Javorníky Mts. belong to sought-after tourist marks. Javorníky Mts. become the paradise for hikers from spring to autumn. Many of well-prepared and marked tourist trails will take the visitors to wonderful places. Many of the tourist trails can also be used for cyclotourism. The water reservoir Nosice, which was built on the Váh river, invites the visitors to try out water sports or just relax. Here in Javorníky Mts. are ideal conditions for winter sports. The fans of cross-country skiing can use many cross-country ski tracks in slightly wavy terrain with long flat parts. Those, who prefer down-hill skiing can use down-hill slopes with ski lifts in Veľká Rača or near Portáš, Veľký Javorník, Čerenka, Straník, Ochodnica and others. New resorts with good technical equipment and background appear thanks to development of tourism in this region. The region under Javorníky Mts. offers many unique and outstanding historical monuments and places, which tourists can visit and they can get to know the rich history and diversity of the region under Javorníky Mts. Region possibilities The region under Javorníky Mts. offers to all many cultural, social, sports and other possibilities during the whole year. Follow the calendar of events on the tourism portal with information and choose, from the rich variety of events happening in our region, the one you are interested in and visit it. You will find here many additional and other services that will make your stay more pleasant and enjoyable. Find on our portal place for accommodation, eating or for fun and relax. 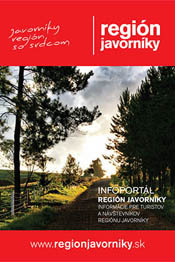 Tourism portal with information from the region of Javorníky Mts.